When French companies come to us in Molière they seem reluctant to make a start and the intervals are inordinately long; but while the curtain is up there is no dawdling and the comedy goes with the speed of a powerful machine.When the Old Vic deviates into Moliere the curtain rises with admirable punctuality, the intervals are not unduly long, but the comedy is apt to crawl. Mr. Miles Malleson's free adaptations of Tartuffe and Sganarelle have a great deal of stage vitality, but they rather encourage the actors to seek for individual traits of character in lines which are meant to delineatc character in terms of intellectual comedy. Both Tartuffe and its curtain-raiser suffer from the leisureliness of the acting. Sganarelle, being a mere trifle, is the greater sufferer. It is a simple misunderstanding about a portrait among people afflicted by a hair-trigger sense of jealousy, and the joke turns finally on a husband who cannot rouse up enough courage to seek vengeance on the supposed lover of his wife. He finally decides to save his honour by telling everyone that the scoundrel is living with his wife. Mr. Malteson gives a delightfully comic performance as the enraged sheep. Yet he dwells so lovingly on the endearing qualities of the fool that he enforces a rather heavy tempo on the rest of the company, and only Miss Christine Finn, as the little spitfire, contrives to maintain the sharpness of her initial attack. If Tartuffe were taken only a little more quickly it would be a most enjoyable performance. Mr. Derek Francis's study of the eternal confidence trickster who hap- pens to have chosen piety for his ploy is well conceived and well executed. It seems a pity that he has, to take the audience so frankly into his confidence when things are going his way. Tartuffe's hypocrisy is so much an integral part of himself that it is disillusionary that he should laugh so much behind the backs of his victims, and the wink to the audience when he has turned impending disaster into triumph is surely misguided. It is unnecessary and there is no room in the theatre of Molière for unnecessary winks. But his deliberation is extremely effective in his attempted seduction of Elmire and on the whole he gives consistency to a good, drily comic, if very English reading of the hyprocrite. Miss Pauline Jameson is charming as the wife who rather enjoys the shocking temptation to which she is exposed. Mr. Gerald James is the kind of Orgon to swallow Tartuffe hook, line and sinker, having all the self-sufficiency of a natural dupe. 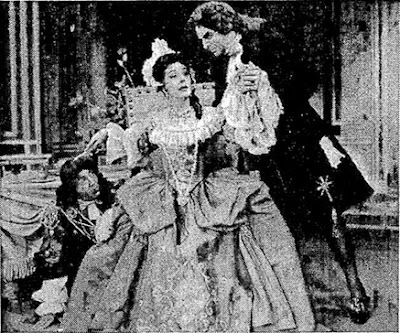 The urbane and reasonable Cleante is played by Mr. Charles West with measure and tact and Miss Silvia Francis flutters and wilts as the timid Mariane. Miss Finn is perhaps a little too pert for Dorine, on whose solid country sense so much of the domestic comedy turns, but Miss Rosalind Atkinson plays the crusty, puritanical and fantastically silly mother-in-law with her usual gusto. English version of Moliere's Tartuffe.